Presented by CIPS and the Latin America & Caribbean Study Group (LACSG) of the Canadian International Council (CIC)/National Capital Branch. Free. In English with bilingual question period. Registration is not required. please arrive by 3:45 p.m. Seating is limited and available on a first come, first served basis. 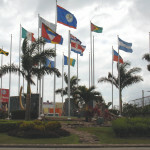 Despite our extensive people-to-people links, shared business connections, long history of engagement, the launching of free trade negotiations in 2007, a $600 million development cooperation commitment by Canada to the region, and a number of joint security initiatives, the Canada-Caribbean Community (CARICOM) relationship is seen as not realizing its full potential. Why? What can be done to resolve some of the impasses? And how do we move forward? Panelists: Madame Marie-Lucie Morin, Executive Director (ret.) for Canada, Ireland & the Caribbean at the World Bank; HE Harry Nawbatt, High Commissioner of Guyana to Canada; Phil Rourke, Executive Director, Centre for Trade Policy & Law, Carleton U & uOttawa; John Graham, Ambassador (ret.) and member of CIC/NCB LACSG; Stephen Baranyi, Associate Professor at uOttawa and Chair, CIC/NCB LACSG.